In May, a pedestrian was seriously injured after being struck by a marked Portland police vehicle. The Portland Tribune reports that the pedestrian may have stepped off the curb into the path of the vehicle, and that he suffered traumatic injuries from the impact of the collision. Medical personnel were called immediately to the scene and the pedestrian was transported to the hospital for further treatment of his injuries. Unfortunately, pedestrians are often seriously hurt when they are hit by a car. When the driver of the vehicle is at fault, the motorist should be held legally accountable and should compensate the victim for injuries. Pedestrian accident attorneys in Portland, OR can represent victims of collisions to obtain monetary damages. When a pedestrian accident occurs, the injuries can go beyond the physical harm that the collision causes. Recently, the New York Times published an article on what life is like after a serious pedestrian collision. The article included first-person stories from several staffers of the newspaper who had been involved in pedestrian crashes. Those whose stories were told had been obeying the rules when they were struck by a motor vehicle, and were left with lingering emotional trauma after their physical injuries had healed. The author experienced a broken pelvis and a broken femur that necessitated surgery after he was hit by a delivery truck. He had to have a interior vena cava inserted to prevent blood clots, and he needed stitches and blood transfusions. Although he has recovered from the physical injuries, he reports that he still flashes back to the accident when he sees a delivery truck in the city. He also indicates that he is much more cautious when walking around, always checking multiple times before crossing the street and waiting until the light changes before stepping off of the curb. Another New York Times staffer was involved in a pedestrian knockdown crash, blacking out when she was hit and coming to in the middle of the road. She said that her experience was one of the most difficult and frightening situations she had endured in her entire life. The consequences of the accidents were far-reaching for those affected. For one contributor to the story, the crash had occurred four years ago but she still experienced fear every time she had to cross the road. In addition to checking over her shoulder multiple times as she crossed, she said that if a car got too close to her, she would panic and freeze. These experiences are not uncommon and many crash victims experience lingering emotional harm or even suffer from post traumatic stress disorder (PTSD). Drivers who cause pedestrian accidents need to be held responsible, and victims need to fight to ensure the necessary resources for recovery. 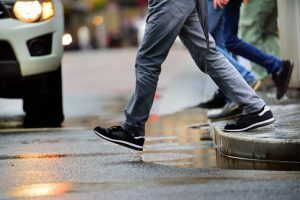 An experienced attorney can help those involved in pedestrian accidents to maximize their recovery and to have the best chance of getting fair compensation for non-economic losses. Portland accident victims should contact Zbinden & Curtis, Attorneys at Law, by calling 1-503-287-5000.